After last week’s finale, where Azrael was blown up by a bazooka, Bullock gives a statement to the press, that he was blown up by “persons unknown” and “cannot confirm” it was Theo Galavan. When asked how much longer Bullock will be the police captain, his response: “Until literally the second someone else wants the job.” Jim waits for Bullock in his office and wants him to bring in Strange. Bullock’s hands are tied, but Jim points out that his are not, and stomps away. On his way out, Jim runs into Bruce, who is worried that Strange has Selina after she didn’t return from her adventure in the asylum. They go back to Wayne Manor and meet with Lucius and Alfred. Alfred gives Bruce the business for putting Selina in trouble. 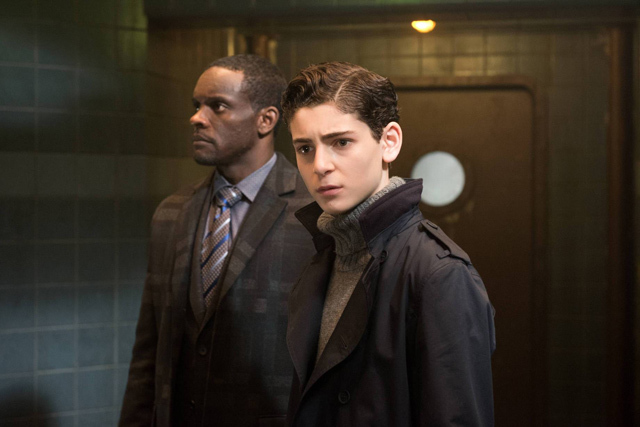 The group comes up with a plan, which Alfred “forbids,” but in that way that he isn’t actually going to stand in the way. Bruce and Lucius will request a tour of Arkham under the guise that, as representatives of Wayne Enterprises, they want to see where their money is going. Lucius suspects that Strange is using radioactive isotopes for his experiments. He will use a palm-sized Geiger counter to find where the radioactivity is coming from, mark off the place, and Jim will bring in the cops. Over at Arkham/Indian Hill, Selina is hiding from Bridgit, who is trying to flamethrower her to death – while Strange watches from above. Bridgit, now believing herself to be Firefly, the goddess of fire, tells Selina it is an honor to be her sacrifice. Selina knocks her out and turns the flamethrower on the door, trying to break out. She isn’t having much luck. It is around this time that an unseen woman, in an unseen location, makes a call. “We need to gather the Court,” she says. Strange is working on another monster, one who wakes with white eyes and tiny black pupils. He has been spliced with octopod DNA, making is skin stretch like putty. Strange is pleased, and promises to return to tell him who he is. Peabody is concerned that they will be shut down once their benefactors discover the monsters he has made. Strange thinks this is better, designing and controlling the personas they create. He wants to move on to subject 13. 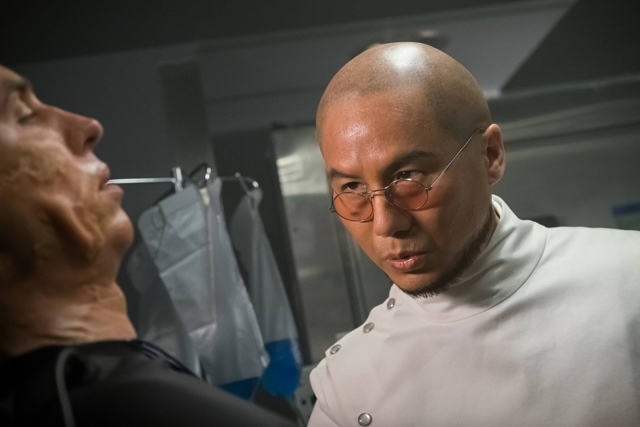 Subject 13 is Fish Mooney. He has mixed her DNA with cuttlefish DNA, and wants to double to voltage they use to wake her. It works. She is given a fancy Indian Hills-created costume, and is welcomed by Strange, asking who she is. No answer. So Strange tells her she is a war goddess. “No,” Fish says. She remembers who she is and demands to know what the hell is going on. Fish is put into a cell while Strange and Peabody watch her on the security camera. Strange doesn’t know what it was that helped Fish maintain her identity, but he thinks their “masters” will be pleased. Elsewhere in Arkham, Ed is being terrified by his new cellmate, Stirk, a psychotic cannibal whose chain is just short enough to keep his chompers off Ed. Ed begs Peabody to let him out, or else he will go to the cops and tell them they are making monsters in the basement. He tries a different tactic, and offers to help them against Jim and the GCPD. Eventually, Strange agrees. Strange meets Lucius and Bruce in the parking lot, and is pleased to finally meet Bruce. He agrees that he will make an exception and give them a tour. Bruce goes with Strange to speak in his office while Peabody shows Lucius around. He goes back to his trunk to get his “jacket,” but that is where Jim is hiding – with an Arkham guard costume. Jim’s ID is expired, but the main guard lets him in anyway. After all, he has the uniform. Peabody notices the Geiger counter, clicking away casually. Lucius claims it measures air quality, which she shockingly believes. As the beeps increase, Lucius hangs back until it red lines in the dead-end hallway. Lucius marks the spot with chalk and hurries to catch up with Peabody. In Strange’s office, things between him and Bruce start out strained, with Strange telling Bruce that his “friend” Jim came to see him and asked about a project. Bruce plays dumb, and Strange realizes that he is here to find a reason, someone to blame, for his parents’ death. Strange waxes on about how much Bruce reminds him of Thomas. Bruce strains to remain composed, but when Strange says that he pleaded with Thomas not to “go ahead” with his weird projects, Bruce loses his cool. Strange continues, saying that Thomas was the one who orphaned Bruce. “His actions fired the bullet. He knew what he was doing and did it anyway.” Bruce insists his father fought and died for what he believed was right – and he will too. Strange radios the guards, and they take Bruce, Lucius, and Jim into custody. Strange and Peabody watch the trio in separate rooms, and Peabody encourages Strange to just kill Bruce. Strange can’t; he reminds him too much of Thomas. The woman from the Court of Owls appears on the CCTV, clearly having hacked in. Strange promises her everything is under control, which she doesn’t believe. She believes Strange has failed his mission, but Strange promises he returned life and persona to a body just this morning. If given time, he believes he can repeat the results. The Owl woman concedes, but wants Strange to find out what Bruce knows, move everything upstate, and destroy Indian Hill. Another guard brings Fish her lunch. She isn’t happy with what is on the menu and grabs the guard’s hand as he leaves her food tray. She wants a grilled cheese sandwich. Her hand on his skin glows, and the guard turns away, like he is under a spell. He returns later with a grilled cheese sandwich. When asked why he brought it, he doesn’t have an answer, other than that Fish told him to. Firefly has woken up and grabs a spare flamethrower. Selina tries to remind her friends of their history together. Bridgit falters, and remembers she fried her brothers. Not the memory she was going for, but Selina will take it – until she turns the flamethrower back on. Selina fights fire with fire, and sets Firefly alight, but the flames go out. Firefly cannot be burned. Selina tries something different, and drops to her knees. Goddesses need servants, and she volunteers. Firefly accepts and stops trying to kill Selina. Alfred goes to the GCPD, worried that he hasn’t heard from Bruce’s strike team. He wants Bullock to join him in tearing down Arkham, but Bullock reminds him he has something better than a middle aged portly Irish man and a crippled butler: he has the entire GCPD at his disposal. Lucius is brought into Bruce’s cell. The kid feels bad about getting them all involved, but Lucius points out that they chose to help. Ed comes over the loudspeaker and warns them that Jim has his own problems. Ed has been tasked with finding out what Bruce knows, and who he told. If he doesn’t, the room will fill with poisonous gas. Lucius recognizes the voice, and Ed admits he was given this job because Strange knew he wouldn’t hesitate to kill. He gives them five minutes to talk. Jim is strapped into a chair in one of Strange’s laboratories. Jim warns him that the police are coming for him (when we last see the GCPD, donned in SWAT gear, they are just moving out), but he doesn’t care. The orderlies place an enormous metal helmet on Jim’s head, and fill it with a milky solution. They remove the helmet and put it on the putty man. When they remove it, putty man has Jim’s face, a perfect match. Topped off with a wig, the putty man is Jim Gordon. 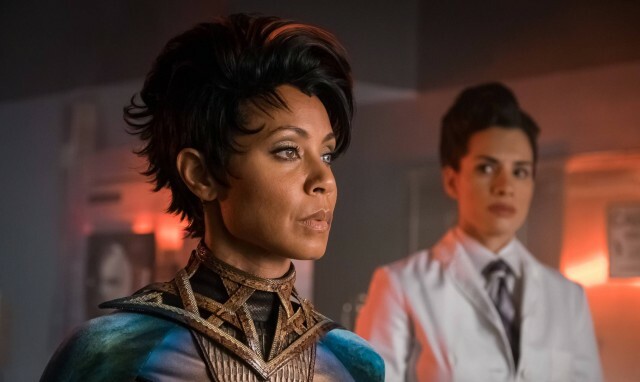 You can watch a preview of the Gotham season finale in the player below.